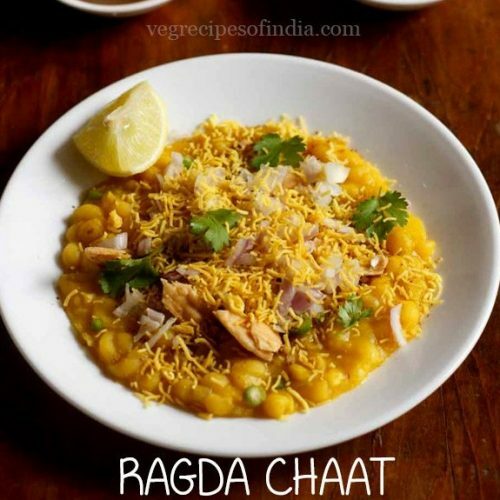 ragda chaat recipe - easy and delicious chaat made with dried white peas or safed matar, spices and herbs. pick and rinse 1 cup of dry white peas. soak the dried white peas in enough water overnight or for 8 to 9 hours. next day you will see the peas doubled in size. drain all the water. in a pressure cooker, add the soaked peas along with 2.5 cups water. pressure cook for 10 to 12 minutes. when the pressure goes low on its own, check if the peas are cooked. sometimes these peas take a longer time to cook. in case they are not cooked, pressure cook for more 7 to 8 minutes along 1 to 1.5 cups water. the ragda should be cooked till tender, soft and mushy. take the cooked ragda in a pan. keep the pan on a low flame. then add turmeric powder, asafoetida and salt to the ragda. stir well. pour ¼ cup water or as required. stir and mix well. simmer the ragda for 4 to 5 minutes on a low flame. keep stirring the ragda so that it does not stick to the bottom of the pan. stir well, soon the ragda will begin to thicken. the consistency of the ragda should not be very thick nor watery. switch off the flame. as the ragda cools it will thicken. take about of half a cup of ragda in serving bowls. sprinkle some roasted cumin powder and chaat masala. then add some finely chopped onions, green chilies. sprinkle a bit of black salt or regular salt as required. drizzle some lemon juice as required. garnish with chopped coriander leaves. then mix well. top it with as much sev you want along some crushed papdis. you can also chaat masala, cumin powder and some salt for seasoning. serve with some lemon wedges and chopped onions along with the ragda chaat. garnish with few coriander leaves.